Seventy years ago today, on August 6, 1945, the US dropped an atomic bomb on Hiroshima, Japan. 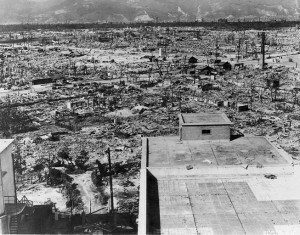 By November of that same year, approximately 130,000 people were dead because of that single bomb, which targeted a civilian population. 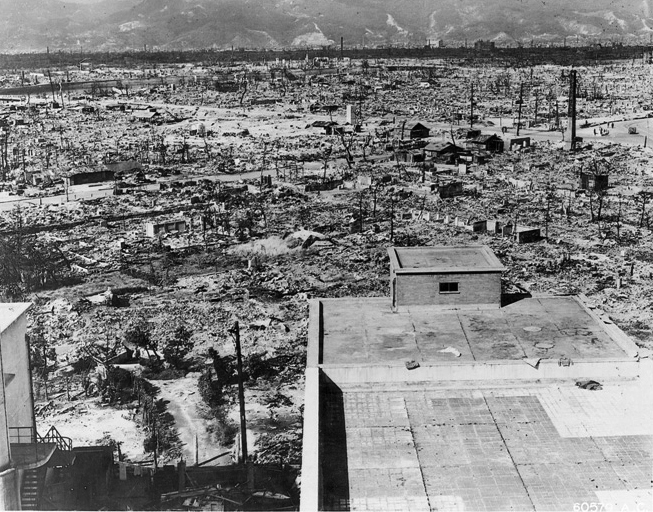 Three days later, the US deployed a second nuclear weapon in Nagasaki. It appears that these horrific weapons were not needed, despite the prevailing myth surrounding their use. Even with the subsequent proliferation of nuclear weapons, the US remains the only country to have ever used them outside a testing scenario, while countries as unstable as North Korea and Pakistan have achieved nuclear weapons capability at some level. As might be expected, Japan’s Prime Minister Shinzo Abe is using the occasion of this anniversary to call for an end to nuclear weapons. Last week, Javad Zarif made an excellent move, in suggesting that now that Iran has signed an agreement with the P5+1 group of countries on its nuclear technology, there should be a push to remove nuclear weapons and all WMD from the Middle East. Recall that Iran has agreed to the most intrusive inspections regime ever put into place in a country that didn’t first lose a war, making their call for inspections of Israel’s nuclear weapons program especially strong. These two calls together represent an appeal to those who prefer peace over war while placing the highest possible value on civilian lives. President Obama lashed out at critics of the Iran nuclear deal on Wednesday, saying many of those who backed the U.S. invasion of Iraq now want to reject the Iran accord and put the Middle East on the path toward another war. One of the saddest aspects of this push for war over diplomacy is that much of it comes from deep within the US government itself. In many of my posts on the path to the P5+1 accord with Iran, I have noted the nefarious process of anonymous “disclosures” coming sometimes from “diplomats” and sometimes from “intelligence sources” that get transcribed into the press by a small handful of “reporters”. Usually the worst offender on this front is George Jahn of AP. A recent retiree from this fold is Fredrik Dahl who now, ironically, appears to be the primary press contact for the IAEA. But never fear, rushing into the void created by the departure of Dahl (or perhaps his insertion into an operative role further inside the apparatus), we have the dynamic duo of Eli Lake and Josh Rogin. Their blather being put out as “journalism” is not worthy of a link here. If you want to find it, try going to Marcy’s Twitter and searching for “not The Onion”. Of course, the high point of this process of manufacturing nuclear charges against Iran and then getting them into the media is the notorious “laptop of death“. Running a close second, though, are the charges that Iran has engaged in developing a high explosives trigger device at the Parchin site. Showing that those who engage in this level of deceit have absolutely no pride, the charges of this work have proceeded despite an equally plausible explanation that the high explosives chamber could just as easily have been used to develop nanodiamonds. Further, those making these charges have allowed themselves to be baited into a ridiculous level of “analysis” of satellite photos of the site, with hilarious results from how Iran has played them. How About “Any Time, Anywhere” Inspections for Israel’s Nuclear Weapons? We – Iran and its interlocutors in the group of nations known as the P5+1 – have finally achieved the shared objective of turning the Iranian nuclear programme from an unnecessary crisis into a platform for cooperation on nuclear non-proliferation and beyond. The nuclear deal reached in Vienna this month is not a ceiling but a solid foundation on which we must build. The joint comprehensive plan of action, as the accord is officially known, cements Iran’s status as a zone free of nuclear weapons. Now it is high time that we expand that zone to encompass the entire Middle East. Israel does not officially confirm its nuclear arsenal, but it is believed to have about 80 warheads. Zarif’s remarks also represent a rebuke to the five permanent members of the UN security council, all armed with nuclear weapons – the US, Russia, France, the UK and China – as well as the three other nuclear-armed states which, like Israel, are not NPT signatories: India, Pakistan, and North Korea. Since a cold war high in 1986, when global stockpiles of nuclear warheads topped 65,000, the main weapons states have reduced their arsenals considerably. There are now thought to be fewer than 16,000 warheads worldwide, of which 14,700 are held – roughly equally – by the US and Russia. But the disarmament is now approaching a standstill. The Obama administration wanted to follow the 2010 New Start agreement with another, more ambitious, arms control treaty, but the dramatic worsening in relations halted progress. Russia and the US are modernising their nuclear arsenals. That last bit about the US and Russia modernizing weapons rather than removing them is especially upsetting, but for now I’d like to concentrate on Zarif’s Middle East proposal. Insterestingly, Zarif points to Iran’s history of restraint on weapons of mass destruction when it came to the Iran-Iraq war. While widespread use of chemical weapons by Iraq in that war is indisputable, Zarif claims that Iran “never reciprocated in kind”. The record seems to bear that out. While Iran did develop their own chemical weapons program late in the war, the evidence that they ever used it is murky at best. One of the many ironies of history is that non-nuclear-weapon states, like Iran, have actually done far more for the cause of non-proliferation in practice than nuclear-weapon states have done on paper. Iran and other nuclear have-nots have genuinely “walked the walk” in seeking to consolidate the non-proliferation regime. Meanwhile, states actually possessing these destructive weapons have hardly even “talked the talk”, while completely brushing off their disarmament obligations under the non-proliferation treaty (NPT) and customary international law. That is to say nothing of countries outside the NPT, or Israel, with an undeclared nuclear arsenal and a declared disdain towards non-proliferation, notwithstanding its absurd and alarmist campaign against the Iranian nuclear deal. Zarif makes three proposals: for negotiations to begin on a nuclear weapons elimination treaty; that this should lead initially to nuclear arsenals being taken off high alert readiness (for example, by removing warheads from missiles); and for the creation of a zone in the Middle East free of weapons of mass destruction. Again, the irony of Israel’s actions are brought into full light here. Another front on which Israel has been vocal regarding the JCPOA relates to restrictions on Iran’s missile program. At the same time Israel wants to severely restrict any further development of missiles in Iran, Israel has an arsenal of missiles already fitted with nuclear warheads and ready for launch. One step in the right direction would be to start negotiations for a weapons elimination treaty, backed by a robust monitoring and compliance-verification mechanism. What better spokesman could the world have for a “robust monitoring and compliance-verification mechanism” than the man who just agreed to submit his own country to history’s most intrusive inspections program for a country that hasn’t just been defeated in a war. He is definitely “walking the walk” when it comes to inspections and compliance. But I can’t help wondering if, should such negotiations actually get underway (note: yes, I realize that the chances are much less than zero), Zarif would allow himself, at least once, to call for Israel to submit to “any time, anywhere” inspections of its nuclear program. https://www.emptywheel.net/wp-content/uploads/2016/07/Logo-Web.png 0 0 Jim White https://www.emptywheel.net/wp-content/uploads/2016/07/Logo-Web.png Jim White2015-07-31 09:52:242015-07-31 09:52:24How About "Any Time, Anywhere" Inspections for Israel's Nuclear Weapons? Partial screengrab of New York Times article announcing agreement. John Kerry and Ernest Moniz are on the right, while Javad Zarif and Ali Akbar Solehi are in the center of the photograph. It has been nearly 20 months since the group of P5+1 countries (China, France, Germany, the Russian Federation, the United Kingdom and the United States) and Iran reached an interim agreement limiting Iran’s work on nuclear technology. Progress since that interim agreement has been painfully slow (and obstructed as much as possible by Israel’s Benjamin Netanyahu, neocons in Congress and United Against Nuclear Iran), with a number of “deadlines” for achieving the final agreement missed. Journalists covering the final phase of negotiations in Vienna over the last two weeks eventually got so exasperated with the process that they began reporting on the number of Twizzlers consumed by the negotiators. Fortunately, the US, led by John Kerry, with technical support from Ernest Moniz (with the backing of Barack Obama) and Iran, led by Javad Zarif, with technical support from Ali Akbar Salehi (with the backing of Hassan Rouhani) did not give up on the process. A final agreement (pdf) has now been published. Iran reaffirms that under no circumstances will Iran ever seek, develop or acquire any nuclear weapons. That is the heart of what the entire process has been about. Iran’s uranium enrichment work, which grew to over 18,000 centrifuges installed at two facilities, was viewed as a rapid route to a nuclear weapon. Even though no facility in Iran has been identified where enrichment was proceeding to the highly enriched levels needed for a bomb and Iran had demonstrated no ability to make a bomb from highly enriched material, “conventional wisdom” stated that Iran would only need a few months (as of the signing of the interim agreement) to produce a working bomb. Throughout the process, Iran has claimed the work was only for peaceful uses (electricity production and the production of medical isotopes). Things had gotten really ugly back in 2011 when the IAEA lent credence to claims that originated in the Laptop of Death, where Iran was accused of past work aiming at developing a bomb. By making the blanket statement that Iran will never seek a nuclear weapon, Iran is publicly acknowledging that the West will reinstate economy-crippling sanctions should evidence surface that it is seeking a weapon. Further, by saying it “reaffirms” as much, Iran is sticking to its previous claims that it has not sought a weapon in the past. Those dual points are important enough to be appear twice on the first page of the agreement. On first blush, the final agreement looks quite robust. I intend to address only the technical aspects of the agreement and will leave to others analysis of the aspects of the plan relating to the removal of sanctions, although it is interesting that it appears that the plan will be submitted for UN Security Council approval before Congress is expected to have a chance to chime in. The plan is referred to as the Joint Comprehensive Plan of Action, or JCPOA. It establishes a Joint Commission of P5+1 and Iran that will monitor implementation of the agreement. We have “reached a historic understanding with Iran, which, if fully implemented, will prevent it from obtaining a nuclear weapon,” US President Barack Obama said from the White House rose garden after the deal was announced April 2. On its face, the framework announced Thursday for an agreement that limits Iran’s nuclear program goes further toward preventing Tehran from developing a nuclear weapon than many experts expected it would, including requiring an international inspection system of unprecedented intrusiveness. The version of the agreement as released by the US can be read here. Let’s take a look by sections. The next section of the agreement is titled “Fordo Conversion”. Iran’s Fordo site is the underground bunker built for uranium enrichment. Iran has agreed not to enrich uranium at Fordo or to have uranium or any other fissile material present for 15 years. While many have advocated a complete shutdown of Fordo, the agreement provides a very elegant alternative. Fordo will now become a research site under IAEA monitoring. Had the site shut down, where would all of the scientists who work there now have gone? By keeping them on-site and under IAEA observation, it strikes me that there is much less concern about those with enrichment expertise slinking into the shadows to build a new undeclared enrichment facility. https://www.emptywheel.net/wp-content/uploads/2016/07/Logo-Web.png 0 0 Jim White https://www.emptywheel.net/wp-content/uploads/2016/07/Logo-Web.png Jim White2015-04-03 09:41:062015-04-03 09:41:06Iran, P5+1 "Succeeded in Making History"
Iran’s president has denounced ISIL terrorist group for its savagery and said US presence in the region has exacerbates [sic] the terrorism crisis since 2001. Iranian President Hassan Rouhani, in an exclusive interview with NBC News’ Ann Curry, denounced ISIS for its savagery but also branded the U.S.-led coalition against the terror group as “ridiculous.” Speaking from the presidential palace in Tehran ahead of his visit to the United Nations, Rouhani questioned President Obama’s decision to go after ISIS with airstrikes. “Are Americans afraid of giving casualties on the ground in Iraq? Are they afraid of their soldiers being killed in the fight they claim is against terrorism?” Rouhani said. “If they want to use planes and if they want to use unmanned planes so that nobody is injured from the Americans, is it really possible to fight terrorism without any hardship, without any sacrifice? Is it possible to reach a big goal without that? In all regional and international issues, the victorious one is the one who is ready to do sacrifice. Rouhani’s accusation that the US wants to carry out this fight without sacrifices seems to be a very accurate description of the approach by the Obama Administration. One Democratic member of Congress said that the CIA has made it clear that it doubts the possibility that the administration’s strategy could succeed. He added that, as the CIA sees it, the ramped-up backing of rebels is an expansion of a strategy that is already not working. “The CIA also believes that its previous assignment to accomplish this was basically a fool’s errand, and they are well aware of the fact that many of the arms that they provided ended up in the wrong hands,” the congressman said, echoing intelligence sources. On the subject of negotiations over Iran’s nuclear weapons program, Zarif said all the “wrong options” have already been tried and that “we are ready” for an agreement. “The only problem is how this could be presented to some domestic constituencies, primarily in the United States but also in places in Europe,” because “some are not interested in any deal,” he said. “If they think any deal with Iran is a bad idea, there is no amount of — I don’t want to call it concession — no amount of assurance that is inherent in any deal because they are not interested in a deal, period,” Zarif said. Gosh, considering how the US is working closely with anti-Iran groups, even to the point of interfering in lawsuits to prevent disclosure of how the government shares state secrets with them, Zarif seems to have a very clear grasp of the problem a deal faces. Despite his harsh comments about the US (and harsh comments about ISIS, as well), Rouhani also held out hope that the P5+1 final agreement can be reached. https://www.emptywheel.net/wp-content/uploads/2016/07/Logo-Web.png 0 0 Jim White https://www.emptywheel.net/wp-content/uploads/2016/07/Logo-Web.png Jim White2014-09-18 09:04:372014-09-18 09:04:37Rouhani to NBC: "US Presence in Region Exacerbates Terrorism Crisis"